Little by little and step by step ads have become a collector's item; some people collect ads from a specific brand, some others from a specific decade and some others from specific graphic designers. Advertising has been always the art of the ephemeral but thanks to the time that has passed since the first ad was conceived and designed, we can say that advertising is starting to get old... what is good at least in one sense. With aging also comes recognition and museums dedicated to the advertising field are more common to find (especially here in the US and in Europe) and just in time to help, the internet came along. So now there are more resources to find old ads or contribute with the ones you have. 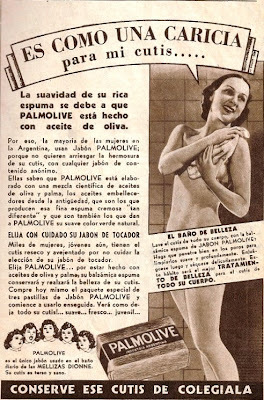 A relatively newcomer is an Argentinian website called "Historia de La Publicidad" (Advertising History) where I spent a couple of hours last week uploading part of my collection of old ads from Argentina but as my contributions are not showing yet in the general pool you can see some of them here too. I was introduced to the founders of the site when visiting Buenos Aires and I was happy "like a dog with two tails" -a Spanish saying- to find out that finally someone is trying to rescue from oblivion those small pieces of "art" that -artistic or not-, are another way of going back in time. Advertising as part of the daily culture is pretty useful to analyze what issues and behaviours were common in a specific moment in time. 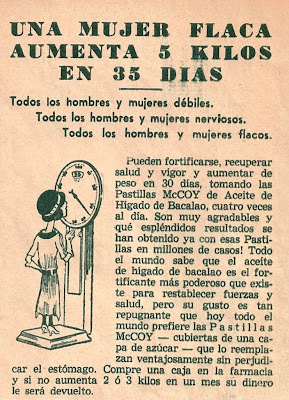 For example, take a look at this ad for a product to "gain weight", that promises you can gain around 10 pounds in 35 days... 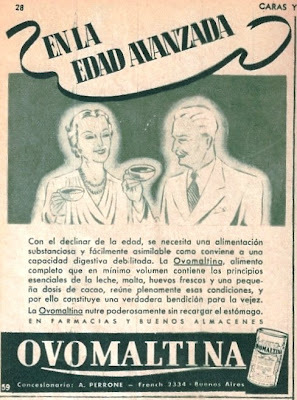 In a time when everything seems to revolve around losing weight it sounds almost like sci-fi but this type of products were pretty common at that time, not only in Latin America but in the US too..., because weight was a symbol of health. Last but not least, two classics worldwide: Colgate and Palmolive. The first using a resource common at the time (the comic strip to tell a history), the second "making pictures talk", another common way of advertising in the 30's. 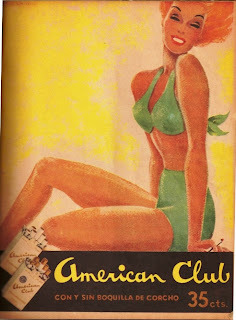 I will be posting more of my small collection here but if you want to see more oldies, just visit "Historia de la publicidad". When it comes to print ads you don't really need to understand Spanish to enjoy those classic designs; just click at the top, where it says "Grafica" and browse their collection! we sure become older everyday.